Bloggers' Dinner Party: It's August! Remember how I told you Kate is getting ready for a big move? I volunteered to help her run the Blogger's Dinner Party for August, and it's here! The Bloggers' Dinner Party is a monthly link-up for you to show off handmade placemats, table runners, napkins, trivets, aprons, potholders, dishtowels and any other handcrafted item related to making or serving a delicious dinner! (For inspiration, check out past entries here!) Items should either be hand-sewn or significantly modified (such as by screenprinting, freezer paper stenciling, embroidery, etc). Each month you can enter one item (or set of items); the item(s) entered must have been made within the past year. A randomly-selected entry will win that month's prize, and I will also highlight a few of my favorite items on my blog! 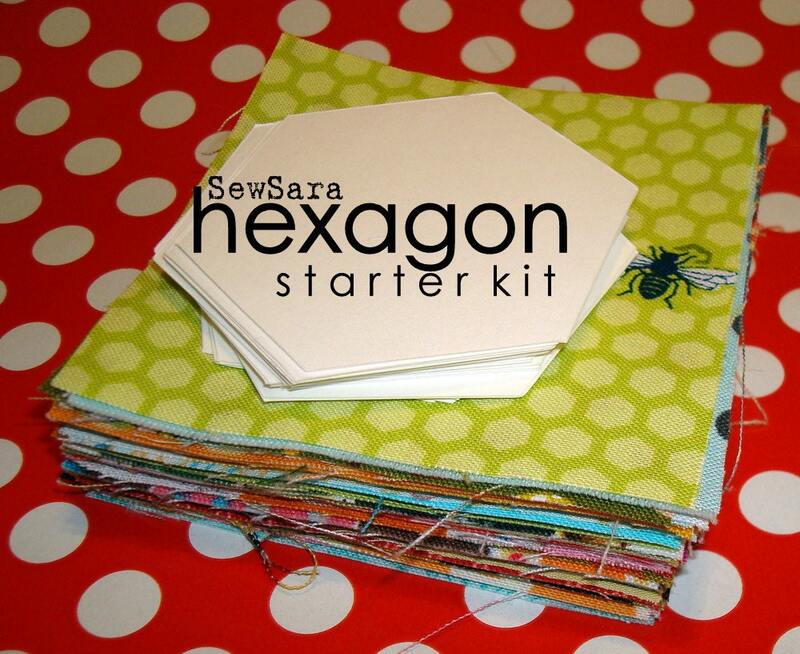 One random winner for the August party will win a fabulous small hexies kit from Sew Sara! You can also get free shipping on a kit with the coupon code LINDSAYSEWS. The kit comes with 25 hexagon templates and 50 small charms to get you started on your hexagons. Wowza--I love my hexies kit! A second random winner will get a prize from my fabric stash, which is TBD. A good surprise, I promise! 1. Write a new blog post (written during the month of the party) showing off your item(s) - tell us about the process of making them, who they were for, a special story about using them, or whatever you like! Feel free to share a recipe for our dinner party, too, if you like. Entries for each month will be open until the 28th of that month. 2. Link back to the party using the button - either in the body of your post or in your sidebar (or both!). Just copy the html below and paste it into the html window for your post or a html gadget for your sidebar. 3. Come back and link up at the linky below! Make sure to use a link to the specific post for your entry, and then you will be able to pick which picture you want to feature as well. 4. If you like, hop over to the Bloggers' Dinner Party Flickr pool and share your photos there as well. 5. Make sure to visit others' posts too and leave comments - a key ingredient for a great dinner party is good conversation! Thanks for helping Kate during her move. Loved your July BDP project!